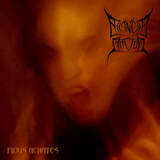 Given the mostly underwhelming quality of many an underground young Russian band I have heard lately, you can call my Surprise of the Month designation of Arcanum Sanctum a homey pick, but Fidus Achates has been both a revelation and a breath of fresh air. A myriad of bands are playing Black Metal, some are in the business of Christian (read White) Metal, and long faded Russian metallers Cherniy Kofe (Black Coffee) even professed to play Bright Metal. With this, I nominate Arcanum Sanctum to espouse Sincere Metal. Fidus Achates may not have uncovered a new style unheard of before, but it is presenting melodic death/thrash from one heart’s depth thinking that it is indeed breaking walls. This heart must belong to Vadim “Sad” Nalivaiko from Komsomolsk-on-Amur, a far-far-away city in Eastern Russia where Siberia meets China. Having persevered through numerous line-up changes, he was finally able to have the album see the light of the world through an up-and-coming Russian label More Hate Productions. The album is full of bouncy, both incendiary and incinerating, but absolutely captivating melodic death/thrash which should shame Children of Bodom, Kalmah and Eternal Tears of Sorrow that they have deviated from the style they originally called home (albeit all moving in different directions from there). One More Lie, Ghost of War and Shadowed, like non-stop opening salvos lounge the album forward, expansive melodies, quick kaleidoscopic-speed changing riffs and nimble fleeting leads are tempered in places with pulsating vibrating keyboards. Shadowed turns out to be more thundering with headbang gathering some strength, but the title track brings it back to a racing, more breakneck thrashy rhythm reminding of the early Dark Tranquillity, before the voluminous keyboard was discovered by the Swedes. Vadim handles the vocals himself, and his are mostly vomitous shrieks a la Alexi Laiho, with an occasional from-the-depth growl (Fidus Achates) or a gang shout. Even though I can push myself to hear a sporadic Russian word or sentences, the vocals prove universally extreme metal enough that you won’t be able to decipher which language the lyrics are in, which is somewhat of a shame, since I found the Russian text to be rather profound in spots. Arcanum Sanctum further proves its versatility and maturity when the second part of the album displays a wide-ranging variety of tracks. Here we have slower, heavier, rolling Moment of Death, borrowing some from Suffocation riffs. The bass intro properly predicts the doomy sense of foreboding and grief this track is going unveil. The Way to No Man’s Land is an electroacoustic instrumental on par with In Flames Hargalaten from Lunar Strain. Dreamkeaper provides another splash of harmonized thrash intensity after the most awesome keyboard intro, and finally Outroduction is also not afraid to mix in some electroacoustic guitar with the piano. The sound of the album, mixed and mastered by Arkady Navaho at his studio in Moscow, combines both power and clarity, complementing the band’s approach. The only other Russian band of similar style I was excited about was Belarus Asguard, and what do you know, that band is also on More Hate Productions now, giving this label definite applause for recognizing quality. If you ever thought that Hatebreeder was one hell of an album, Fidus Achates will leave you longing for those good ol’ times.